Amanda Nisbet is this year’s featured speaker for the Antiques at The Gardens Red Diamond Lecture Series. Photo courtesy of the Birmingham Botanical Gardens. Amanda Nisbet will be making her first visit to Birmingham next month to speak at Antiques at The Gardens. But the nationally known designer, whose business is based in New York, doesn’t expect to feel like a stranger in a strange land. Those who attend her Oct. 6 lecture will learn about her design process – and likely be entertained by her lighthearted sense of humor. Nisbet is from Montreal but spent some of her growing-up years in the South. She said her son and daughter grew up in New York but went to the University of Virginia. She recently moved to Richmond, Virginia, and opened a new office in Charleston, South Carolina. “The South keeps circling back in my life,” she said. After boarding school, Nisbet headed north again – this time to Vermont’s Middlebury College, where she studied art history. Nisbet had another early career interest. “I was ready for Hollywood, but Hollywood wasn’t ready for me,” she said, laughing. Although her dream of becoming a star in the acting world didn’t materialize, she’s made a name for herself in the design world. “My family had an interest in design and dabbled in it, but not professionally,” she said. “I was brought up in beautiful homes. My mother and grandmother had great taste, and I absorbed some of that by osmosis. She opened Amanda Nisbet Design in 1998. Since taking that leap, Nisbet has become known for her lively balance of colors, patterns and textures. 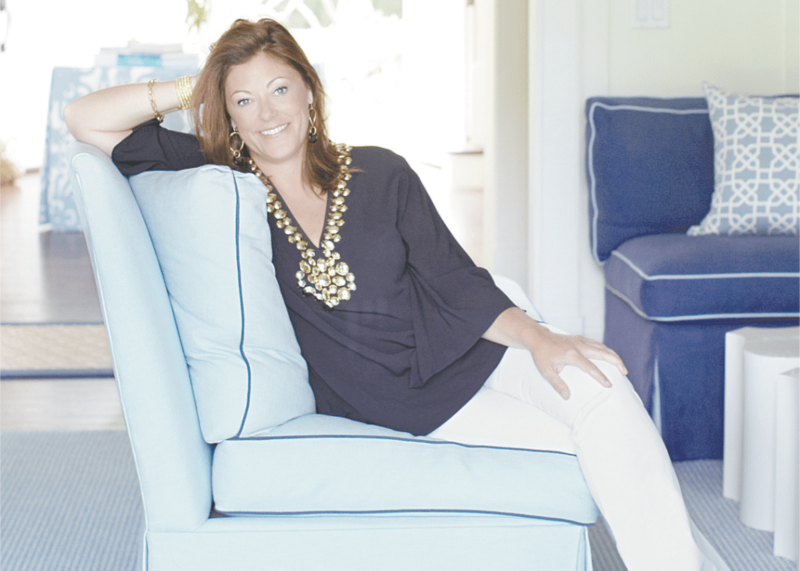 Her projects have been featured in high-profile publications including Elle Decor, House Beautiful, Coastal Living, New York Spaces, Oprah at Home, Traditional Home, Veranda, The New York Times, Town & Country and the Washington Post. She’s created beautiful spaces not only in the United States and North America, but in Europe, too. Nisbet emphasizes function as well as form. At the same time, she’s not fond of rooms that are rendered unattractive by having too much emphasis on making them child-proof. Nisbet said that, although she enjoys getting to know her clients, that’s not always possible. In addition to her design business, Nisbet also has lighting and textile lines. That means she has a demanding schedule. “Sometimes it’s too much, but I’m an empty nester and like to stay busy so I’m not stalking my children,” she said. Nisbet is an author, too. Her first book, “Dazzling Design,” was published in 2012. Nisbet’s Antiques at The Gardens lecture is at 10:30 a.m. on Friday, Oct. 6. Tickets are $40 and are available at bbgardens.org. After the lecture, she’ll sign copies of her book.